Planning, shopping and making family meals can be hard, especially when children know what they want and like. Trying new things as a family can sometimes feel stressful before you even start cooking! 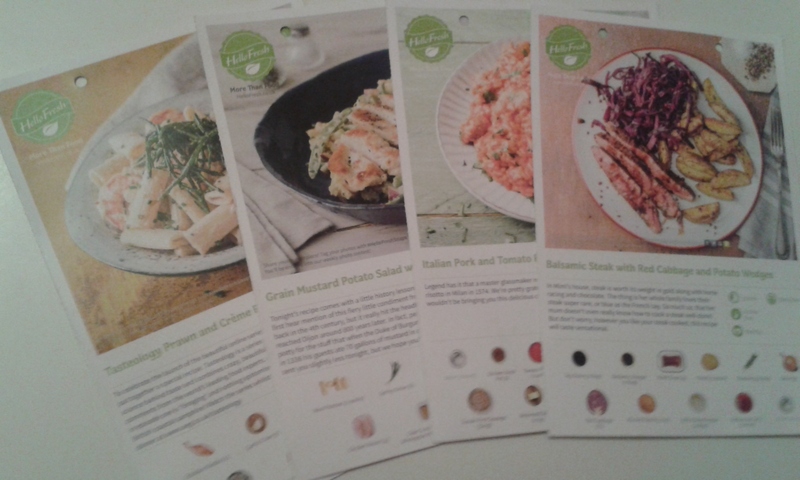 So when I was contacted about HelloFresh I knew it would be perfect for us and for our readers who get stuck in a rut when it comes to trying new meals as a family. HelloFresh even deliver to Northern Ireland! They are the first box of it's kind that I have found can deliver here. HelloFresh is a weekly subscription box service that takes all the stress out of meal planning, shopping and even the cooking of meals. Their head chef Patrick and his team create nutritious meals that are easy to recreate at home. They also make recipe cards with easy to follow, detailed instructions accompanied by pictures of each step to guide you. Then HelloFresh fills your box with fresh ingredients. The classic Box which is for 2 -4 Adults and contains recipes from all around the world. You can choose to have 3 or 5 meals a week for 2, 3 or 4 people. The Veggie Box which is for 2 or 4 adults. This box is perfect for vegetarians and contains recipes based on wonderful, fresh vegetables. The box aims to "broaden your veggie repertoire." There are 3 meals per week. The Family Box which is for 2 adults and 2 children and contains recipes that are well rounded and nutritious while ensuring there is no extra spice for those little taste buds. You can choose 2 or 4 meals per week. We went with the family box even though there are only 3 of us. I do think however that the family box was best suited to us with child friendly recipes based around the nutritional needs of a family and the meals seem more suited to our over all tastes. Our box arrived on the Tuesday (the first delivery day of the week available to Northern Ireland by HelloFresh). You can see the box above. Upon opening our box We found all the ingredients neatly packaged.The box contained fresh vegetables which where packed in one half of the box with a small cardboard tray containing the smaller and more delicate vegetables. The other half of the box held a white bag which contained all the chilled ingredients. The bag contained a layer of sheep wool in a clear breathable bag (This is recyclable) which was wrapped around the chilled ingredients and the ice packs to keep the food chilled through delivery. Even though our box arrived on one of the hottest days this year in Northern Ireland the ice packs where still cold. The box also contained a few offers in the envelope on top of the box. Inside the box we found every ingredient needed to create the recipes in the correct quantities and the recipe card. The ingredients are listed below. 2 chicken stock pots, 1 carton of tomato passata, 2 garlic cloves, fennel seeds, cider & horseradish wholegrain mustard, red wine vinegar, soy sauce, balsamic vinegar, mustard seeds, 4 x white whine vinegar and redcurrent jelly. These came in mostly sachets. The recipe cards for all four meals are above. 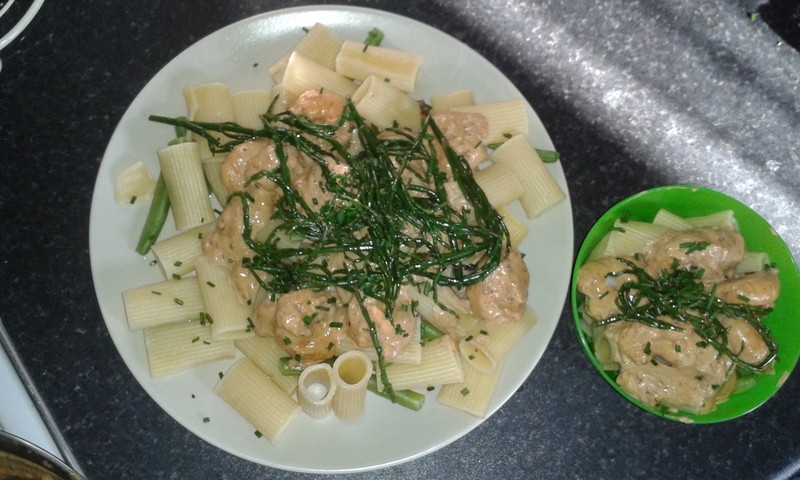 The first meal we had was Tasteology Prawn and Crème Fraîche Rigatoni with Samphire. 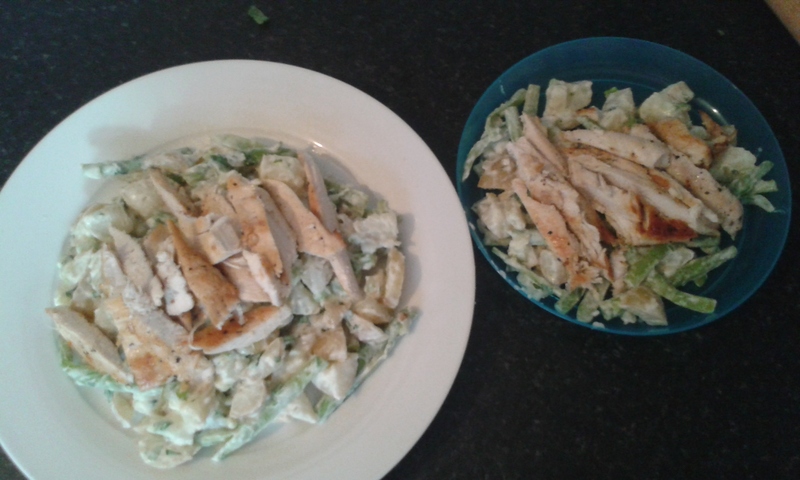 The above picture shows 1 adult and 1 child portion. This was the only meal in the box which had to be eaten in the first 2 days and as the box has travelled further to get to us we thought we would have it on the first night. I made this one alone and spent about 1 hour in total in the kitchen both prepping and cooking. The meal was easy to make and I really enjoyed the easy flow of the recipe. All the prep for this meal is done while waiting for a pot of water to boil. There is no time at all wasted during the cooking of the recipe but you still seem to go at a good pace where everything is timed to perfection. Everything made it to plate cooked and ready to eat at the same time, something I have never achieved before. Simon did have a substitute of chicken instead of prawns as he doesn't link prawns of any kind but this was easy to add in with the extra chicken I had bought and actually worked well with the same ingredients. 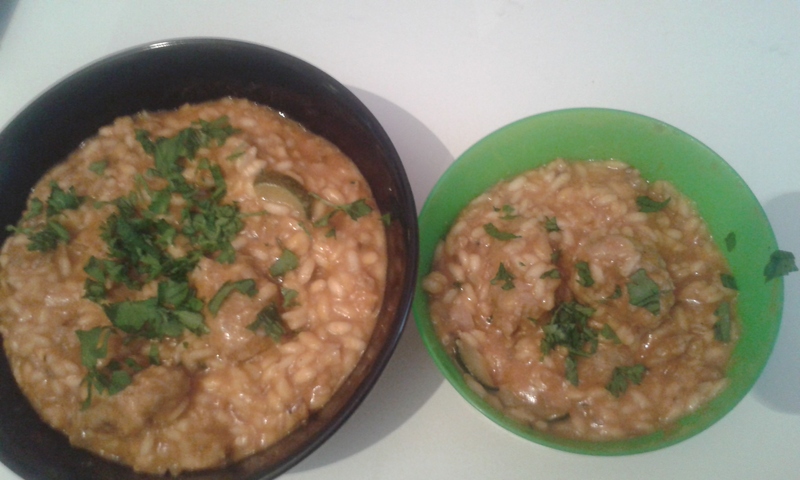 This meal was a hit all round and even D loved it after a little bit of persuading to try it! He likes many of the ingredients separately but we weren't sure how he would be when we added them all to the same bowl. My sauce did come out a slightly orange colour although I still haven't figured out why! 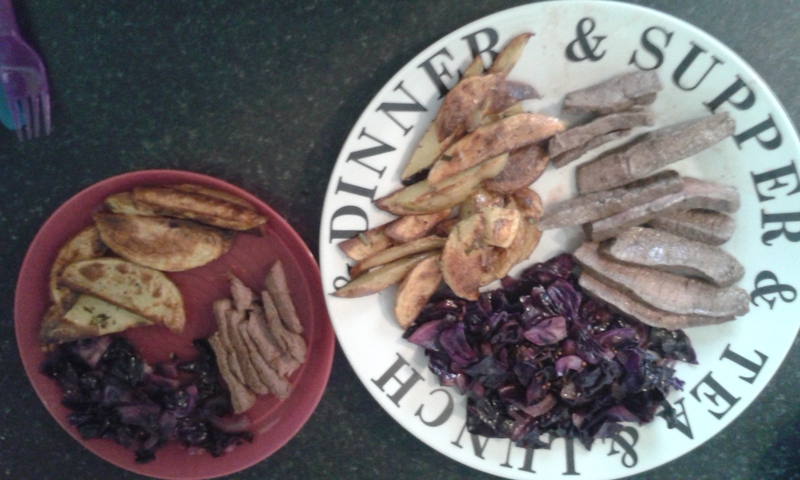 The second meal we enjoyed was made by Simon on the Wednesday, it was the Balsamic Steak with Red Cabbage and Potato Wedges. Simon cooks steak much better than I do and he prefers to cook meals that include steak after I seriously over cooked it a few years ago. I haven't been allowed near any since! I knew that we all love homemade wedges as they have a regular appearance on our weekly menus and steak is always a big hit however the red cabbage was new and different for us. Simon really seemed to enjoy making this meal even though he struggled with following the recipe card. He isn't used to following a recipe and will usually just add what he feels like and taste to adjust throughout the cooking. He did leave out most of the white wine vinegar as he felt it was too much to add when D was going to be eating it. I must say that I think this recipe is our favourite of the week. Everyone loved it and ate every piece. This is one that we are certainly going to have again. It was also easy to alter for 3 people instead of four and the extra ingredients ( one flank steak and one potato) where used for a quick lunch the next day when added to a salad. We had the last meal in our box on Sunday. It was Grain Mustard (We didn't have the mustard) Potato Salad with Chicken. Simon is allergic to mustard so we knew before we got the box that this meal was going to be very different for us. The mustard came in a little sachet that got threw out when it arrived so there was no chance that it could get used. Simon made this meal again and he really did a great job, I do think this one took the longest to make although that could have been Simon taking his time to figure out if taking the mustard away would impact the use of any other ingredients. Simon thinks that the prep of the ingredients in this recipe needs to be completed before you start cooking due to needing to individually chop the green beans and to butterfly the chicken. He feels that the potatoes ended up cooking for too long and he had to remove them before he got to the step where removing the potatoes is mentioned which is after the chicken is prepped and cooked. Other than the potatoes Simon did enjoy making this recipe but found that he felt stressed about getting the whole meal cooked and ready to plate at around the same time. He did get everything on the plate hot and ready to eat around the same time after he added the potatoes to the hob again to heat them up again. We all enjoyed this meal, it was delicious. D wasn't too keen on the sour cream dressing which was probably due to there being no mustard included which altered the taste. I ended up washing most of it off in a strainer for him to eat half way through dinner. I on the other hand did really like the sour cream taste with the potatoes and veg, it was new and different. I think it worked well with the ingredients we had used. Our HelloFresh box contained an information card on Samphire which is the British veggie of the month. Not only does the card contain a wealth of information about Samphire but it also has fun, quirky pictures which appeal to children. I wasn't aware that Samphire contained so many vitamins and minerals and it was a new taste for us as I would never have known what to do with it before. There are opportunities to get children that are a bit older than D into the kitchen and cooking with you. Learning about how to cook and what makes a good meal is always a big plus when it comes to family meals as let's face it we all want our kids to eat healthy and develop a good habit when it comes to eating and I think that HelloFresh creates a good way to involve children in the cooking process with supervision and help. The perfect meal for doing this in our box would have been the Tasteology Prawn and Crème Fraîche Rigatoni with Samphire as it was easy to follow as well as being different and having the information card on Samphire. I think that HelloFresh is a great subscription box for everyone and their family box is perfect for working into family life while saving you time both before a shopping trip and at home. The family box meals are mostly adjustable to accommodate 3 family members and contain well balanced meals that are both fun and easy to make. I would recommend HelloFresh for everyone looking for a new way to change up their diet with new, delicious recipes. The family box is perfect for both families of 3 and of 4. Taking the stress out of meal time and planning, HelloFresh provides everything you need to create the perfect family meals. You can sign up for the weekly HelloFresh Family box by clicking on the link. The box we received is £64 working out at £4 per person, per meal. Disclaimer: We received this box from HelloFresh, the recipe-box delivery service in return for an open and honest review. All thoughts and opinions expressed above are our own.